Diamonds are the gemstone of choice for most marquise engagement rings. A marquise cut diamond is a classic cut for a diamond and can make the diamond appear larger than it is. Some also claim that a marquise cut diamond will make your hand look slimmer because of the shape of the diamond. Whatever the reason, marquise cut engagement diamond rings have been popular for many years. Marquise engagement rings are out of the ordinary. Its unique cut isn’t something seen on a regular basis. If marquise engagement rings are to your liking, why not consider spicing up the cut by choosing a center gemstone other than a diamond? There are other gemstones that are just as beautiful, or even more beautiful, than a traditional diamond and can be used for an engagement ring. They add color and brilliance to an engagement ring and will cost much less than a diamond of the same size. It may be worth your consideration and Novori can place a gemstone in almost any or our settings. Just call and as for more information. So, you’re looking for an alternative to a traditional diamond as the center stone for your engagement ring? Then look no further than your own birthday or zodiac sign. Buying the ring for someone else? No problem. Just use their birthday or zodiac sign. Having a birthstone as your center stone in your ring will add extra symbolic meaning to the engagement ring. Of all the engagement ring cuts, marquise engagement rings go exceptionally well with alternative gemstones. The marquise cut is what makes it so special. Garnet Marquise Engagement Rings – Garnet is the birthstone for the month of January. The garnet is a fiery red gemstone. It looks great when flanked by traditional diamonds. Amethyst Marquise Engagement Rings – Amethyst is the birthstone for those born in February. The amethyst is a deep, rich purple – the color of royalty. Aquamarine Marquise Engagement Rings – Aquamarine is the birthstone for March and October. Aquamarine gemstones are light or powder blue. Sapphire Marquise Engagement Rings – April actually has two birthstones, diamond and sapphire. Sapphire also represents September. The dark blue sapphire serves as a great alternative to diamond. Emerald Marquise Engagement Rings – Emerald is the gemstone for both May and June. The rich, dark green color would compliment any ring. Pearls and alexandrite (usually purple or green) can also represent June. However, pearls aren’t typically used with rings. Onyx or Ruby Marquise Engagement Rings – Onyx and ruby represent July. Onyx rings are pretty common among men. Onyx is completely black, and some men feel it’s a strong color that represents them well. Rubies are bright red, similar in color to garnets. Peridot Marquise Engagement Rings – This August birthstone is a lighter shade of green. Pink Tourmaline Marquise Engagement Rings – Pink tourmaline represents October, and is dark pink. Aquamarine can also represent October. Topaz Marquise Engagement Rings – Topaz is the birthstone for November. It comes in a variety of colors, although most often light blue or light brown. Turquoise Marquise Engagement Rings – Turquoise is the main birthstone for the month of December, although ruby can also be used. Turquoise is described as being sea blue. As you can see, when it comes to the center stone for a diamond engagement ring, there are many alternative to the traditional diamond. Choosing a colored gemstone for an engagement ring will set you apart from the majority of those who choose diamonds. The color you choose doesn't even have to represent a birthday. It can have some other special meaning. It can be your favorite color, the color of your significant other’s eyes, or some other color with significant meaning. Make your engagement ring special and personal. 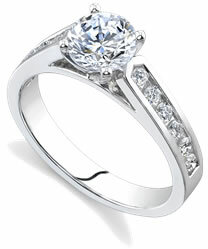 At Novori Jewelry we custom make all engagement rings right here in the United States. That means we can make is special just for you and that you can have an engagement ring with a center stone as a diamond or gemstone without any problem. Call us for more information at 1-877-877-4141 toll free.